Like other volumes in the Spearhead series, this book takes readers to the cutting edge of warfare–for a close look at the make-up, operations, and performance of a military unit operating independently and forcefully at the forefront of battle. 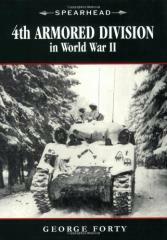 With a focus on aspects of war that most narrative histories omit–logistics and supply lines, communications, battlefield terrain, and command and control–this book offers an unparalleled view of the experience of the 4th Armored Division in World War II. Included are a brief history of the unit, its theater of operations, and the combat situations it faced first spearheading Patton’s Third Army in its race across France, then leading the attack to relieve the embatttled Screaming Eagles ofthe101st Airborne Division at Bastogne, and finally into the heart of the Reich itself, crossing into Czechoslovakia by VE Day. Copiously illustrated with photographs, organizational diagrams, tables, and unit markings (both tactical and individual), the book covers every aspect of this unit’s role in the war, from training and strategic planning to engineering and execution. It is an unusually detailed account of the true nuts and bolts behind the drama of the 4th Armored Division in World War II.